::: Off the Radar :::: New Juan Maclean!!!!! That's right... Juan Maclean is back with a brand new album. The last we heard from him was 2005's Less Than Human. He is set to release his second full-length, The Future Will Come, on 4/7/09 on DFA Records. While I thought that his DJ set was 'whatever', his newest record is a nice step forward, albeit more minimal yet more experimental than his previous effort. This album is full of propulsive beats, pulsating grooves, and thick, funky bass lines that get you ready for a night on the dancefloor. His trademark robotic disco-funk elements are still present, with some pleasant new surprises. 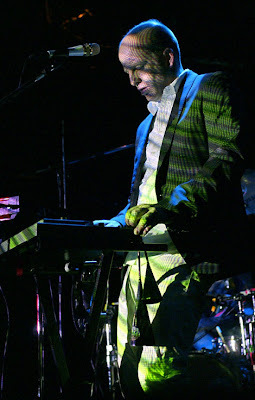 There are a couple of slower numbers such as Human Disaster, which features Juan singing over a sparse and haunting arrangement of just piano, vocals and some tribal-esque drums at the end. One of my favorite songs from the album is No Time. It reminds me a bit of his '05 hit Give Me Every Little Thing and is no less catchy. Album opener The Simple Life is a great disco-house song that really sets the tone for the rest of the record. Here is a full track listing from the new album, as well as a few songs for your listening pleasure. The album is really good. I can definitely here inspirations from label mates LCD Soundsystem (...is The Future Will Come part II of Losing My Edge?? Musically and lyrically...) and definitely Human League. I totally hear the LCD-ness!!! hah!